Published in Rafu Shimpo, August 9, 1955. Members of the Young Buddhist Association (YBA) tour bound for the Hawaii Territorial Young Buddhist League (YBL) conference board a Trans World Airlines (TWA) airplane for at the Los Angeles International Airport (LAX), Los Angeles, California, August 12, 1955. 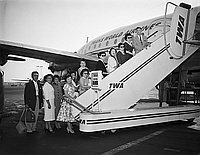 Twelve men and women stand in a line on tarmac and stair ramp leading to airplane on right. Includes, Ryo Munehata, tour leader (top), Ben Honda of San Diego (bottom), Kiyo Teramaye, Kimi and Ayako Minamide of Los Angeles, Masako and Mary Deguchi, Hisako Tanji of West Los Angeles, Mary Yusa of Pasadena, Ichiko Suzawa, Mary Yamamoto of Higashi and Troy Yamamoto of Senshin. Typed on original negative envelope: Y.B.A. at International Airport.